Tesla to take wraps off long-anticipated Model 3; Genius adds button to report abuse; Conservative group says companies' LGBT advocacy is corporate bullying; Chipotle eyes burger market; State Department goes on bro humor Twitter rant. 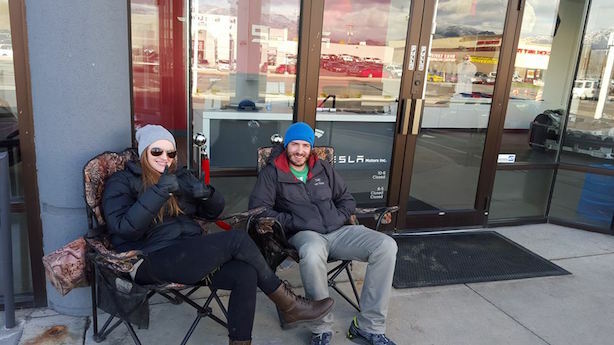 Fans of Tesla are hoping not to be left out in the cold on the Model 3. (Image via Tesla's Facebook page). Fans of the electric car brand are lining up to get a glimpse of the company’s latest model, its first targeting a mass audience. The launch is a test for Tesla’s long-term business model, which to this point had only targeted the wealthy. The first Model 3s won’t ship until late next year. Annotation site Genius has added a button to let users report online harassment after critics said its News Genius platform made it too easy for users to troll authors. Rep. Katherine Clark (D-MA) wrote a letter to the company this week saying it should make it easier to report abuse. A conservative group known as Texas Values has said organizations such as Apple, Disney, and the NCAA are "corporate bullies" for urging Georgia’s state government to backtrack on a law largely considered to be anti-LGBT. Eighty organizations signed a petition this week urging North Carolina to repeal its recently signed law preventing local organizations from passing their own LGBT protections. Undaunted by its E. coli crisis, Chipotle has trademarked the term "better burger," indicating it may try its hand at running a burger chain. The paperwork was filed March 11. However, a Chipotle spokesman told The Wall Street Journal that it devised the idea last July, before its food-safety crisis began. The State Department’s Twitter account aimed at travelers got blowback on Thursday for too much bro humor about going on spring break. "Not a 10 in the U.S.? Then not a 10 overseas. Beware of being lured into buying expensive drinks or worse — being robbed," it tweeted. The State Department apologized on Wednesday evening. AP pushes back against reports it helped the Nazis. NYT snarkily says no to NFL retraction request. Twitter executives pitch Dorsey on standalone private messaging app. Trump turns around quickly on abortion comments, releases letter about tax returns. Corporations get cold feet about sponsoring Republican convention.